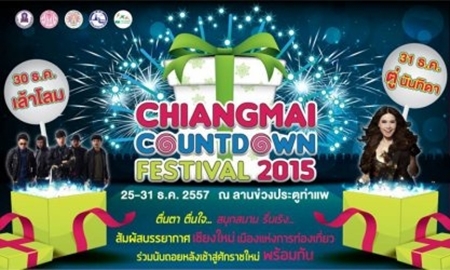 CHAING MAI – Chiang Mai Province has kicked off New Year countdown activities in the city center. Several of Chiang Mai’s landmarks such as Thapae Gate, the city moat’s bridge and public gardens have been decorated with colorful lighting and Christmas trees. The festive ambience has drawn Thai and foreign tourists as well as passers-by, most of whom don’t miss the chance of getting cool photos for themselves. Merrymakers can also enjoy a variety of fun-filled activities, including folk performances and games. They can shop for locally-made products, try local food and send beautiful postcards of Chiang Mai at the Thailand Post booth. The activities will take place until 1st January, 2016.